Proven methods for building an online income stream Maybe you dream of making money with an online business, but haven't tried so far because you'd have to quit your current job and enter the risky world of Internet startups. Or because you think you need lots of capital and way too much time. Or you think the field is maxed out and overcrowded. Or that you need to be age twenty-four-with an amazing invention to sell. Or just because the economy's too bad right now. If these reasons sound familiar, Dave Lindahl and Jon Rozek beg to differ. 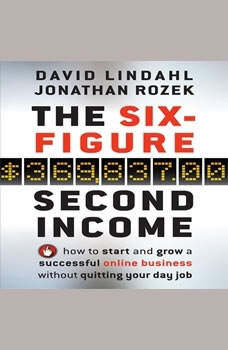 Having done so themselves, they know you can create a very significant side income online, and their new go-to guide The Six-Figure Second Income shows you exactly how! Filled with common-sense advice and proven tips, this audio book supplies you with a complete toolbox to take the things you know or do best and sell them online for a profit-all in your spare time, working at your speed. You'll get a no-nonsense approach to creating and selling simple, effective information products that will, with time and work, produce a sizable income stream. You'll also discover: Ten false barriers on your road to online business success Six very real dangers to your success Ready-made ideas for quick and profitable products Helpful tips for creating saleable content quickly and easily Seven building blocks of a good Web site Common marketing mistakes and their fixes How to use Google tools and other online resources to discover new trends and markets Secrets to creating an upward profit spiral If for some reason you object to making money, don't listen to this audio book. Otherwise, pick up The Six-Figure Second Income and start building a rewarding and growing stream of online profits today!